So this one has been a bit of work just because it is so darned detailed. Trying to make sure I’ve painted all the details, and have them the right colors and shades has been a bit of work. But it’s coming along now. I’ve got it to the shading stage and next up is doing some highlights. Did I mention the details on this model are crazy? There is lots of trim that can be difficult to work into. I found myself having to go back and correct errant brush strokes quite a bit. Also, there are a number of places where detail is sort of hidden. Mainly metal pieces. So your brush work has to be more careful than normal. 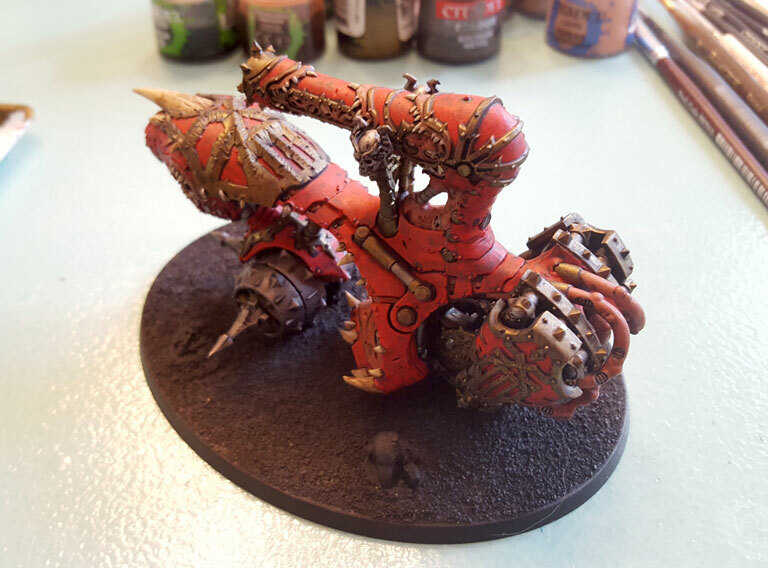 I’m really glad I magnetized the Bloodletter crew and their platform. It would have made getting to some of the model’s details nearly impossible. And it’s stuff that, on close inspection, can be seen. Normally, I land pretty close to the usual GW paint scheme. But on this one I decided not to. 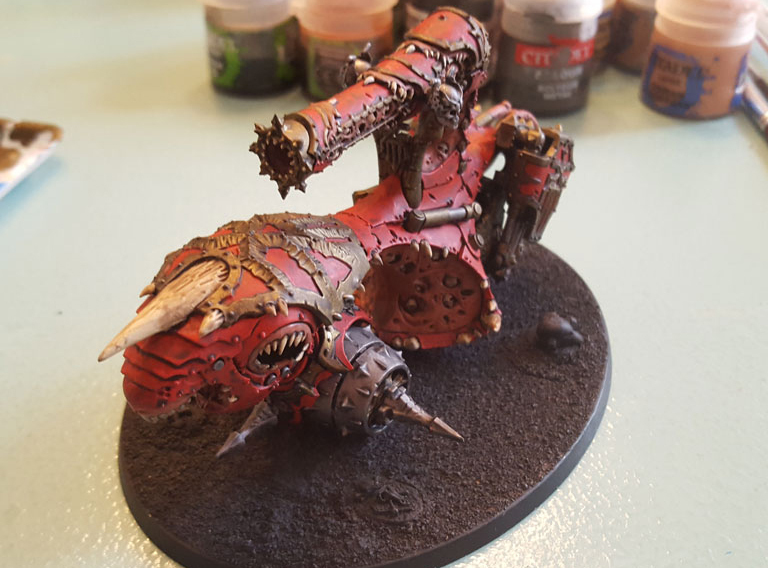 If you look in the Khorne Daemonkin book, you’ll see the armor plates on the Skull Cannon are black. To me, that would have looked out of place with the rest of my army. Yes, yes, Khorne is a Chaos god, so Chaos is chaos. But for me, no. For me it’s “blood for the Blood God” and black just doesn’t say that to me. 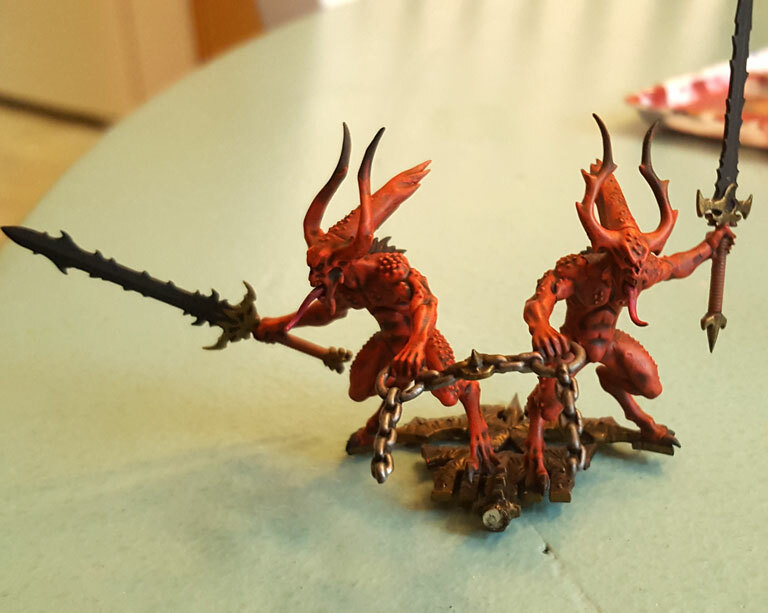 The Bloodletters have been the easiest part of this model to paint. In fact, I used a bit of dry brush technique on them to speed up the process. The results have been pretty good. I have a few highlights to do on the Bloodletters, but it won’t take very long at all to finish them. We’ll see how the rest of the highlights go. Hopefully it won’t take too much time, and I can avoid too many bad brush strokes. It feels weird spending so much time on this model that won’t be in my main army. This sucker is going to serve as one of my summoned units from Blood Tithe points. I’m interested to see how it does on the table top. Oh, and I mentioned other projects I’m working on. 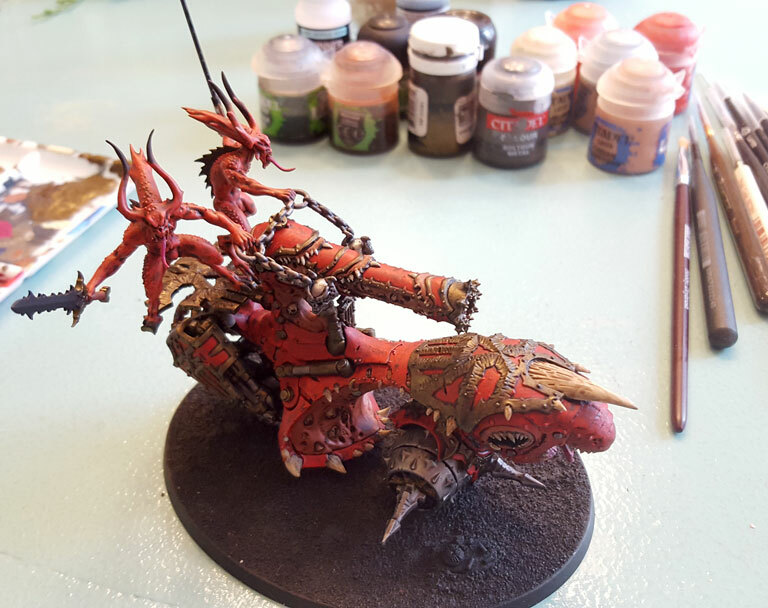 After the Skull Cannon is finished, I’ll have three other units for my Khorne Daemonkin army, then I will consider it essentially finished. After that, I’ll be doing something a bit different – a loyalist marine force. Now, I have stacks and stacks of Space Marine kit that has been lying around for years. The bug first got me back when the plastic loyalist scouts and plastic loyalist Terminators came out. So that’s like more than 10 years ago? Anyway, I kept buying Space Marine stuff here and there. Unfortunately, with the recent up-size in Space Marine model bases, it means I have a bunch of Space Marines with the original 25 mm bases. 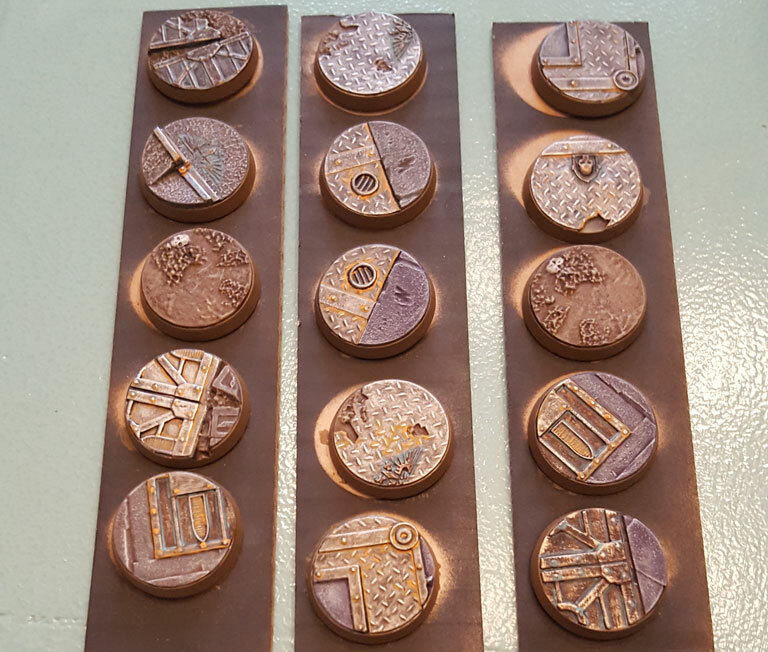 These bases comprise the contents of one sprue, and the box has four sprues. So I have another three sets to go. I enjoyed painting them and they went rather quickly. This was the first time I’ve tried a rust/corrosion effect on metal, and I think I did pretty well. The Citadel paints for this (Nihilakh Oxide and Fire Dragon Bright) are just dead on. All you need to do is a bit of thinning and planning. As some reviews have said, the detail on these bases is not as crisp as on most other Citadel models, but that doesn’t bother me too much. I think the base is much more a garnish or side dish to the entrée of the model. To me, they look just about right. And as they cost about the same as just buying the standard 32 mm bases, I don’t see how you can pass them up. These bases have definitely got me looking forward to working on my loyalist chapter.